Search.searchwatchos.com is a browser hijacker that belongs to a potentially unwanted application published by Polarity Technologies, Ltd. It may be promoted as a beneficial tool, however, its goal is to promote its sponsors. By generating web traffic, the developers of the app make money. For computer users that means dealing with never-ending ads, redirects, and other disturbances. 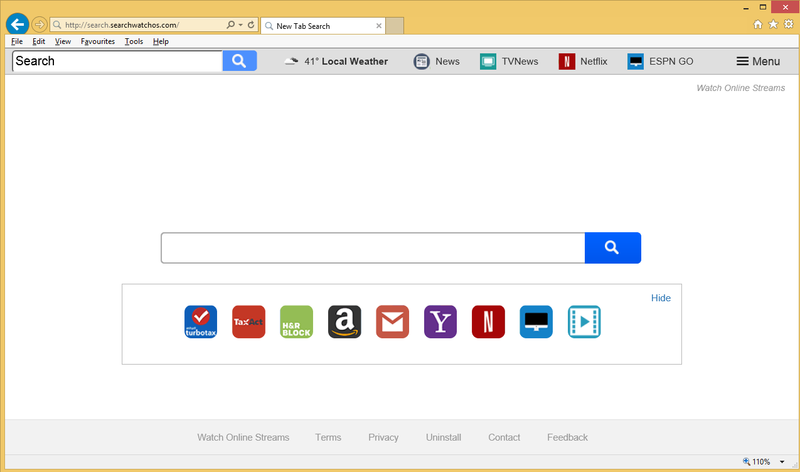 The hijacker affects all browsers, so you will not be able to avoid its symptoms by switching to a different one. In order to get rid of Search.searchwatchos.com, you will have to uninstall its related program and restore your web browser settings. If you do not remember installing the unwanted program onto your computer, that may be because you acquired a free software bundle. When you install freeware, you have to check every step of the wizard, because you will be offered to install additional apps on your PC. If you choose the Advanced mode, you will be able to deselect all unnecessary components. If, however, you install the software in the Express or Recommended mode, you will unwittingly agree to all additional offers, which may include adware, browser hijackers, and other unwanted programs. Once the app gets access to your system, it starts making the modifications by altering your browser settings. Your home page and default search engine get switched to Search.searchwatchos.com. This site may not seem that much different from the usual search portals, but it will bring you sponsored content. You will also encounter adverts on other pages that you visit. No matter where you go online, you will have to deal with advertising data. Moreover, not all of this data can actually be trusted. As nobody checks the ads that are shown to you, they may contain false information. Interacting with the adverts could result in you falling for an online scam. If you wish to prevent that, you should terminate Search.searchwatchos.com as soon as you can. As we have mentioned above, you will have to delete Search.searchwatchos.com related app before you can move on to restoring your browser preferences. There are two possible Search.searchwatchos.com removal options: manual or automatic. Manual removal means that you will have to complete all the necessary steps yourself. We have prepared a removal guide, which can be found below the article, that explains the process in detail. Alternatively, you can use the security tool from our page to eliminate Search.searchwatchos.com automatically. If you implement the anti-malware, you will be able to not only erase Search.searchwatchos.com, but also get rid of other unreliable components that may be on your PC and ensure that it stays protected from similar and more serious online threats.